DALLAS — SUNY Cortland linebacker Kyle Richard is the winner of the 2018 Capital One Orange Bowl-FWAA Courage Award. Richard, a 6-foot, 230-pound senior has become an outspoken advocate for victims of sexual assault and bystander intervention after being shot twice in the summer of 2017 while interrupting a sexual assault. On July 23, 2017, Richard pursued an assailant outside of a party on Long Island. The assailant pulled out a gun and shot at Richard three times, hitting him once in the left quad and once in the right hamstring. A friend, Michael Abiola, was also shot, leading to nerve damage. Richard underwent intensive physical therapy and was able to return to the field and appear in 10 games that season. He wrote “Michael 200%” on his wristbands before games, knowing that, for reasons that cannot be explained, his friend took the worst of it that July night. Richard finished second on the team with 75 tackles, along with 4.5 tackles for loss, three sacks, two fumble recoveries, nine quarterback hurries and two pass breakups. In April, Richard was presented with the Biden Courage Award for Bystander Intervention by former Vice President Joe Biden, along with a Next Generation Award from Kristin’s Fund, which is an Oneida County charity that aims to end domestic violence through awareness campaigns. Richard has also received a thank-you note from NFL Commissioner Roger Goodell. The Lakeview, N.Y., native has spoken at a number of awareness events, deflecting personal attention while hoping that other people around the world can follow his example and step up whenever they are presented with an opportunity to act. “I just want people to believe that it is true: Anybody can be a hero at any given time,” Richard said. “I believe that my teammates at Cortland would’ve been doing the same thing if they were in the situation that I was in. I want to believe that there are so many people, but the problem is not enough people do it. So just be that hero in somebody’s life. Even if you think of little things, just try to be there for somebody. Richard credits another friend, Sulaiman Aina, for initially recognizing the sexual assault at the July party and attempting to break it up as well. Richard was a two-time captain for the Red Dragons, who went 7-3 this season. He finished tied for the team lead in tackles, with 71, to go with seven tackles for loss, 1.5 sacks, one interception, two pass breakups, three passes defended, four quarterback hurries, one fumble recovery and one safety. He is expected to graduate with a degree in kinesiology this spring. His inspiration comes from his mother Sandra, a sergeant in her 28th year with the Nassau County Police Department whose tough-love approach helped shape Kyle and his two brothers. “First let me express how thankful and proud I am of Kyle — as a father of two daughters, his college coach and fan,” Cortland coach Dan MacNeill said. “He is truly deserving of all attention and accolades according to the profound action that draws him into this story of highlight and hardship. The highlight: the obvious action taken two summers ago to save and serve a young girl from assault, along with the actions, that continue to this day to serve society in the pursuit of the perpetrator. “Kyle was raised and self-prepared for this moment. He is emblematic of having and exuding strong principles, possessing behavioral values we all hold dear, including being an ‘active bystander.’ Kyle is that solution, open to right-minded service in the protection of others. Educated by strong family values instilled at home and then thankfully drawn to our program with similar leadership traits, he embodies our culture, as evidenced and honored by his election as a junior captain prior to this heroic story. The Courage Award was first presented by the Football Writers Association of America (FWAA) in 2002. A select group of writers from the FWAA vote on the winner each year. The requirements for nomination include displaying courage on or off the field, including overcoming an injury or physical handicap, preventing a disaster or living through hardship. 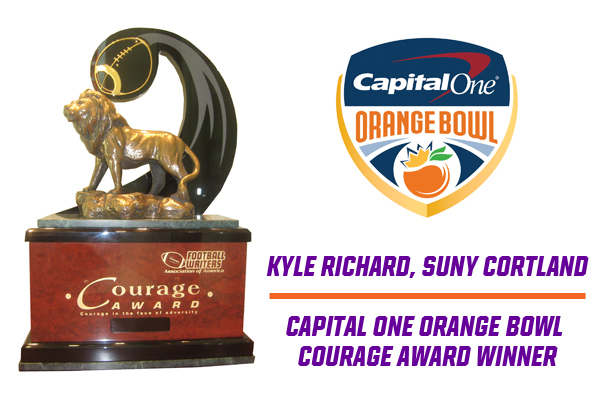 Kyle Richard will be included in festivities during Capital One Orange Bowl week and receive his trophy at an on-field presentation during the Capital One Orange Bowl game between No. 1 Alabama and No. 4 Oklahoma on Dec. 29. Previous winners of the Capital One Orange Bowl-FWAA Courage Award are Wisconsin safety D’Cota Dixon (2017), Pittsburgh running back James Conner (2016), Miami offensive lineman Hunter Knighton (2015), Duke offensive lineman Laken Tomlinson (2014), San Jose State defensive lineman Anthony Larceval (2013), Clemson wide receiver Daniel Rodriguez (2012), Michigan State offensive lineman Arthur Ray Jr. (2011), Rutgers defensive tackle Eric LeGrand (2010), the University of Connecticut football team (2009), Tulsa’s Wilson Holloway (2008), Navy’s Zerbin Singleton (2007), Clemson’s Ray Ray McElrathbey (2006), the Tulane football team (2005), Memphis’ Haracio Colen (2004), San Jose State’s Neil Parry (2003) and Toledo’s William Bratton (2002).